Fox 13 News reported that Lydia Dornacher, of St. Petersburg, came home from a yard sale Monday and was unloading her husband Nathan’s Jeep Grand Cherokee. While she was unloading, Nathan had left his Note 7 in the center console of his vehicle to charge. Lydia Dornacher said she sent her 8-year-old daughter, along with the family’s service dog, to get back in the vehicle because they were going to run more errands. 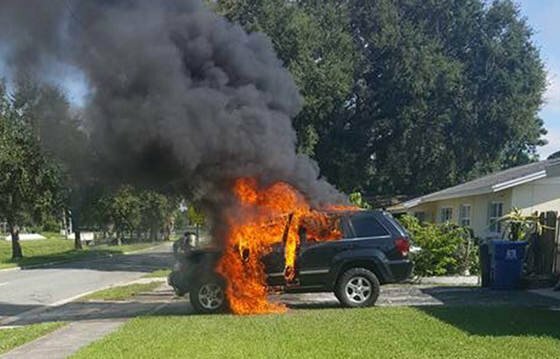 She then said the dog knew something was wrong and when her husband looked outside and his Jeep was engulfed in flames. St. Petersburg fire officials came to put out the fire. Nathan Dornacher told Fox 13 News that he loved his vehicle and had put a lot of money into it. He will now have to find a new ride and a new cellphone. Samsung said in a statement to the station that it was aware of the latest incident. "We are aware of the incident and we are working with Mr. Dornacher to investigate his case and ensure we do everything we can for him. Consumer safety is Samsung's highest priority. With regard to the Galaxy Note7, we are asking owners to take advantage of the Product Exchange Program announced on Friday of last week,” the company said. Samsung issued the recall last week in 10 countries after 35 instances of Note 7s exploding or catching fire. Customers who had already bought Note7s could swap them for new smartphones in two weeks.